There are two basic types of wireless we offer. Consumer Class (2.4GHz & 5GHz) and Carrier Class (5GHz & 3.65GHz). Consumer class is recommended for standard home or small business use. Speeds range from 1Mb to 8Mb, depending on network usage and your signal strength. Carrier Class is recommended for larger businesses or individuals who require a stronger, more reliable signal. The prices for these services are outlined below. *Installation prices may vary depending on the complexity of your internal computer network and the amount of materials needed to install wireless at your location. 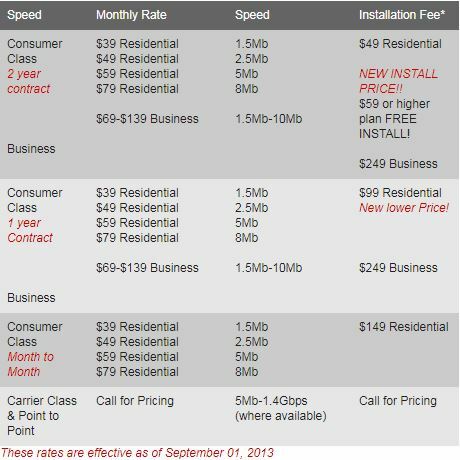 No SLA or QOS service at Residential rates, wireless speeds vary and all speeds are ‘up to’ quoted speeds. Businesses run synchoronis and Residential are 50% upload to download radio. Contract cancellation fee is 50% of the regular monthly fee for the service for the remaining term of the contract. In-city monthly fees for Yakima and Naches – save $10 per plan per month. To qualify for wireless Internet service, your home/office computers must comply with the following list. If your computer(s) fail to meet these requirements, we may not be able to provide you with service. Feel free to call us with any questions. * Newer Ethernet cards do not come equipped with the drivers for older computers with Windows 95/98, so we are only able to install an Ethernet card in computers with Windows 2000 or newer.